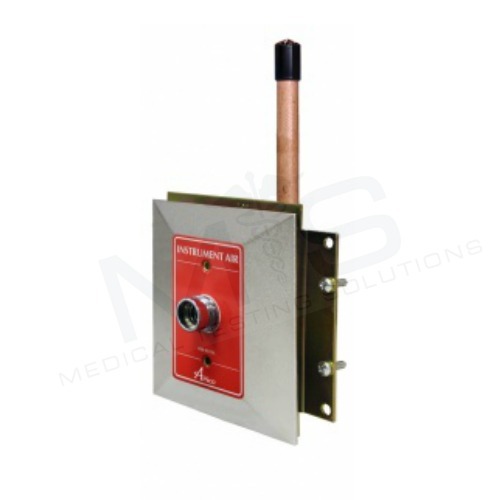 The medical gas outlet shall be an Amico Alert-1 series.Outlets shall be manufactured with a 7 – 3/4″ [197 mm] length type K 1/2″ [12.7 mm] outside diameter (3/8″ nominal) size copper inlet pipe stub, which is silver brazed to the outlet body. The body shall be of 1 – 5/16″ [33 mm] diameter, one piece brass construction. For positive pressure gas services, the outlet shall be equipped with a primary and secondary check valve and the secondary check valve shall be rated at a maximum of 200 psi [1,379 kPa] in the event the primary check valve is removed for maintenance. Outlet bodies shall be gas specific by indexing each gas service to a gas specific dual pin indexing arrangement on the respective identification module.A large color coded front plate shall be used for ease of gas identification and aesthetic appeal.A one piece chromed fascia plate shall frame the outlet. With the back rough-in mounted the outlet shall adjust from 3/8″ [10 mm] to 1″ [25 mm] variation in wall thickness.The outlets shall be of modular design and include a gas specific 1.6 mm [16 ga]. Steel mounting plate designed to permit on-site ganging of multiple outlets, in any order, on 5″ [127 mm] spacing .The latch-valve assembly shall be D.I.S.S. (Diameter Index Safety System) and shall only accept corresponding gas specific adapters.All M.R.I. outlets are manufactured from nonferrous materials.All outlets shall be cleaned and degreased for medical gas service, factory assembled and tested.The outlets are UL Listed and ETL Listed.Amico products comply with NFPA 99. Amico Medical Gas Outlets, Amico Wall Outlets, Amico, Instrumental Air DISS (NFPA) Wall Outlet.